A new book loaded with research, strategies, tips and examples helps teachers build resiliency to stress, avoid burnout and regain teaching effectiveness. When a summer break becomes just a memory and the back-to-school excitement wears off, frequently what’s left are long hours, loads of homework, after-school activities, large class sizes, testing requirements, and relentless pressure from parents and school officials. These are just some of the stress-inducing daily challenges faced by teachers. While teaching is widely recognized as one of the most stressful occupations, there are very few resources teachers can use to learn job-specific stress management techniques. Many magazines devote their back-to-school issues to providing advice to parents and students on how to deal with school stress, yet few even mention teachers’ stress. Online, only one out of ten articles on stress relief in school is aimed at teachers. And the ones that are typically provide only generic advice. That is why Dr. Jack Singer’s release of a new book “The Teacher’s ULTIMATE Stress Mastery Guide” is both timely and much-needed. 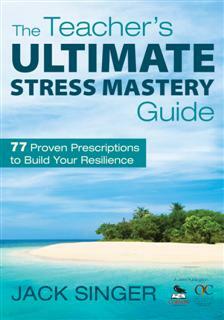 This stress mastery guide is directed specifically for the challenges that teachers face in and out of school. It shows teachers the exact tools to use in proactively building their resiliency to stress and burnout. 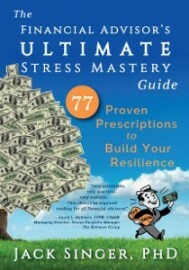 The book includes action plans for mastering the different types of stress, success stories from teachers, and strategies based on cognitive and resilience theory. Beth Madison, the Principal at George Middle School in Portland, OR advises teachers to read this book. “Your stress is not going away. [This book] might not just be a life changer, but a life saver”. Many teachers quit after less than 5 years on the job because of, among other reasons, mounting stress levels. Dr. Singer’s new book helps these frustrated teachers to boost psychological immunity as well as increase teaching effectiveness. It also helps school administrators trying to support and retain their teachers. 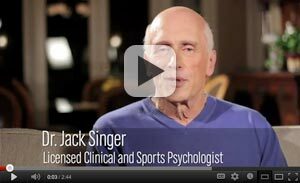 Dr. Jack Singer is a licensed Clinical, Sports and Industrial/Organizational Psychologist, author, trainer and consultant and one of the North America’s top motivational speakers. Dr. Singer is regularly contacted by CNN, MSNBC, Fox and other networks and radio shows for his expertise. Dr. Singer has been in private practice for over 30 years, working with a diverse range of clients from top athletes to families to Fortune 1000 companies. Dr. Singer’s teaching career includes teaching in the Psychology departments of seven universities, including four years as an Assistant Professor of Psychology at the U.S. Air Force Academy. Dr. Singer’s research and self-help articles appear regularly in business, medical, human resources and sports journals across the United States. 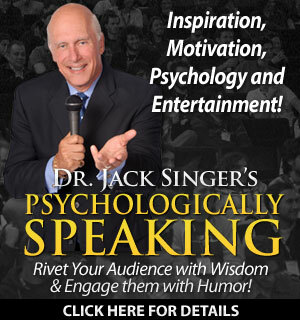 For information about Dr. Jack Singer, please visit http://drjacksinger.com.